NEW YORK, November 26, 2013 - William Holman Gallery is pleased to announce that Liv Mette Larsen has been awarded a Pollock-Krasner Grant. The Norwegian-born, Bushwick-based artist was featured in our group summer show and will be included in our informal New Year's drawings show, which opens Wed, December 18, 2013. Pollock-Krasner Grants are awarded for one year to practicing and actively exhibiting artists. Larsen works with egg tempera on linen, mixing her own paints from eggs, Damar varnish and powdered pigment. Her works isolate elements of Bushwick’s industrial landscape– from the tangled telephone wires hanging outside her window, to the tiles of her studio floor or the darkened figures passing on the sidewalk. Larsen renders these fragments of the cityscapes in flattened colored shapes and exacted silhouettes on raw linen, transforming the gritty urban terrain into meticulous, isolated notes that Larsen can combine, divide and reorient. 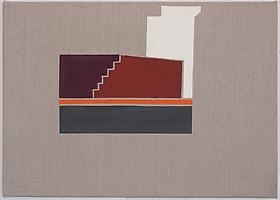 In Berlin, Mette Larsen is represented by Galerie Kai Hilgemanm.